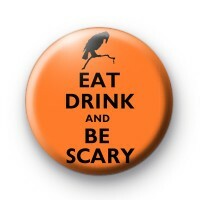 Eat Drink and Be Scary Badges in a spooky orange colour with the text eat, drink & be scary in a black font along with a spooky black Halloween crow. These badges are super popular during the Halloween period & are perfect for any ghouls & witches to add to their spooky costumes. We have a massive range of Halloween badges on the website, so have a browse through the Halloween badge category and pick some out. Perfect to hand out to trick or treat'ers and a good addition to any Halloween costume or decoration. Super fun to hand out to people who knock on your door on October 31st. All Hallows eve needs a selection of our spooky badges. Standard 25mm button badge made in our badge workshop.